Making a playable new campaign for Himeko Sutori is very easy, but depending on the level of detail you want, it can be very time-consuming. We have tried to make it as easy as possible for you to start off by providing you with some template levels to fill in, and you should be able to make your new campaign almost entirely in the editor we provide. Our editor is almost identical to the UDK editor made by Epic Games. For general information on using the editor, we recommend reading through the resources on Epic’s web site. In this document we will discuss the specifics of making a Himeko Sutori campaign. The first thing you should do is choose a name for your campaign and give it a prefix. The prefix is a unique identifier that we will use in several places to associate certain files with your campaign. For example, if you wanted to make a campaign called “The Swordsmith,” you might choose the prefix “Sword.” When you load your new Swordsmith campaign, all of your saved game files will start with the prefix “Sword.” It is important that you choose a unique prefix for your game so that your saved files do not get overwritten or corrupted and so that the game doesn’t run into problems trying to load different levels that have the same name. In the future, when lots of people are making new campaigns, we will recommend creating a prefix directory so that no one makes incompatible campaigns. Go to your Himeko Sutori install folder. If you purchased Himeko Sutori on Steam, your install folder is probably C:\Program Files (x86)\Steam\steamapps\common\HimekoSutori. You can access the install folder by opening the Steam browser, locating Himeko Sutori in your games library, right clicking on it, then going to Properties, Local Files, Browse Local Files. In your Himeko Sutori folder, open RPGTacGame\Content\Maps in a new window. In the maps folder, make a folder named with your campaign’s prefix. Now go back up to HimekoSutori\Templates, and copy all of those files into the folder you just made. Do not copy levels you care about like this. The editor’s database keeps track of lots of connections that persist when you change the file name, which means that when you copy a level and change it, the original level gets messed up. Also, do not open one of your own levels and try to copy it using “save as” and choosing a new file name. If you want to make a copy of one of your own levels, open a new level in the editor, select everything you want from the old level, copy it, paste it into the new level, then save the new level. Also note that this is why we do not keep the templates in the Content folder. If the editor could access the templates inside the Content folder, the templates would get corrupted when you copy them into a new project. You should now have in your folder some files names Template_Base, Template_Town, etc. Rename those files, deleting “Template” and replacing it with your own prefix. To open the Campaign Editor, run Himeko Sutori from the Steam Launcher and select Campaign Editor. Or if you did not purchase Himeko Sutori through Steam, you can open the editor by running the executable with the command-line argument “editor.” So if you want to run the 64-bit executable, then open a command prompt, navigate to HimekoSutori\Binaries\Win64, and type in “RPGTacGame.exe editor” (without quotes) and press Enter. If you don’t have the Steam version of Himeko Sutori, we suggest making a shortcut to run that command so you don’t have to type it in every time. 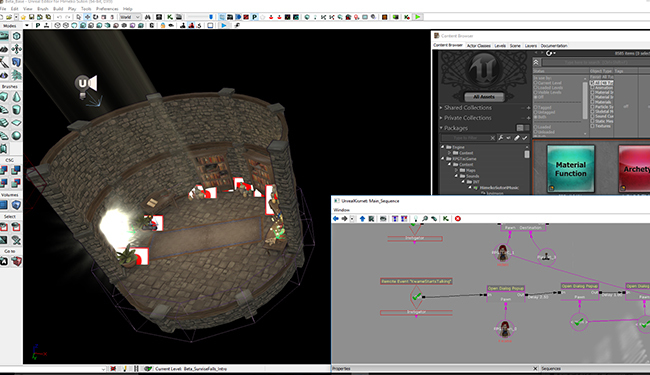 If this is your first time opening the editor, it may take several minutes for the editor to compile all of the materials in the game. We could ship the materials pre-compiled for you, but then every time we update Himeko Sutori, you would have to recompile your own custom materials. We thought you might prefer having to sit through the compilation once instead of after every update. When the editor is ready, open the _Base level that you renamed with your prefix. You might have to wait for materials to compile again. You will also see some error messages telling you that the editor cannot find some files. When the editor is ready, we will start tell the _Base level what your new level names are, starting in the Content Browser window. In the Content Browser window, go into the Levels tab. 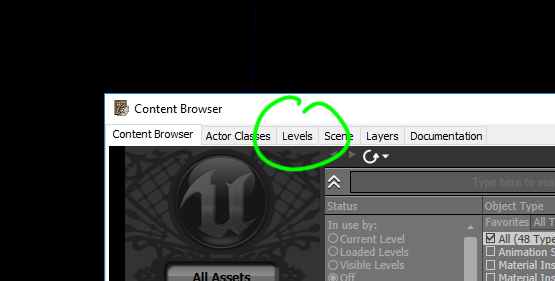 Click on the Level menu, and Add Existing Level. Select all of the levels except for the _Base level. When prompted to choose a streaming method, select Kismet (should be the default) and click OK. This information is not necessary for setting up the template level, but it may help you grasp some concepts that will be useful later. Himeko Sutori campaigns consist of a persistent level (with the filename _Base) that opens and closes the streaming levels where your adventure happens. We will go into more detail later, explaining what should go into your persistent and streaming levels. Right now we are just telling the persistent level which streaming levels it will use. You might notice that there are already some levels named HS_Squad_01 through 20 and HS_GameOver. Those levels are required for basic game functionality and are shared among all of the Himeko Sutori campaigns. We strongly recommend that you not edit those levels. Now open UnrealKismet by clicking on View > UnrealKismet or clicking on the icon. In the window that appears, we need to change the entries in all of the StreamLevels nodes so that they load the appropriate level names. The Kismet sequences might appear intimidating at first, but you can quickly scan for problems by looking for nodes that have a red X over them. The StreamLevels nodes that you will need to change are in the _Base level’s Kismet sequence, at the far right, where the first town and world maps get loaded; and in the _World_01 level’s Kismet sequence, in the EnterTown, EnterAbandonedMine, and ReturnedToWorldNode events. What is all of this Kismet stuff? Kismet is a visual scripting language created by Epic Games. 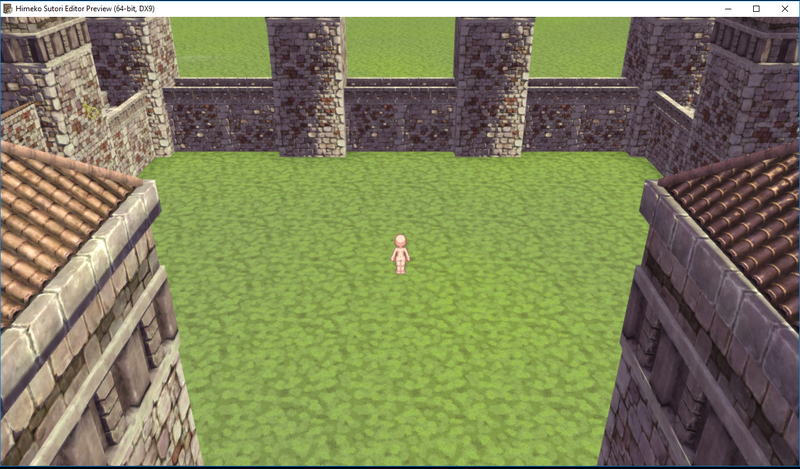 Himeko Sutori uses Kismet to control events in the game world, such as talking to an NPC, opening crafting windows, starting and ending combat, entering and exiting buildings, showing cutscenes, and just about everything else. 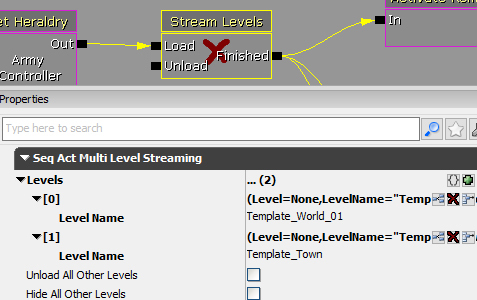 Right now we are just fixing the StreamLevels nodes so that they open and close the levels you renamed. You should be able to make your character walk around. All of the menus should work. And you should be able to leave this town level, walk around the world map, and return. When you’re ready, check the links in the sidebar to add your campaign to Himeko Sutori’s campaign list or check out the how-to topics to customize your campaign.